The last two weeks have been busy for me. Just before Thanksgiving, I did an interview and a guest post. Just after Thanksgiving, I released a new e-book. Yesterday evening, Homeschooling Teen Magazine released the interview; this morning, Sarah Holman posted the guest post up on Homeschool Authors. In conjunction with these, I am running a free book promotion on Amazon. Today, and through tomorrow, Sweet Green Paper and The Last Heir are free on Kindle. 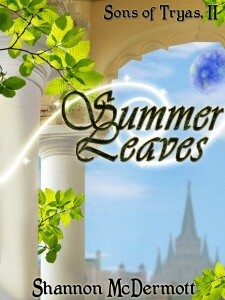 As for the e-book, I am happy to announce the release of Summer Leaves: A Story in Three Acts. It is the second book in the Sons of Tryas, with Beauty of the Lilies leading the way. Ruark, Lord Heir fourth in line for the throne, and once first in line, came so close. Still, he missed it entirely. His brother reigned, and dreamed, and Ruark himself wandered, burning his restlessness on distant, wild planets. Then the premier of the Assembly found him, with an offer to give him everything he ever wanted, at only a small cost to his soul. In Summer Leaves, Shannon McDermott continues the story of the sons of Tryas, begun in Beauty of the Lilies. Sold on Kindle Amazon; estimated length 67 pages; price $2.99. To read the beginning of the book, go to Amazon and either “Look Inside” or download the sample.